Our science curriculum is based on Science Fusion Program which is aligned to Next Generation Science Standards. The science curriculum is made up of the study of Natural Science, Biology, Chemistry and Physics. The students study plants and animals and their habitat, the human body, chemical reactions, machinery, electricity, and motion just to name a few. They become more aware of their own safety and the health care of their bodies. They develop scientific thinking which includes observation, investigation, questioning, and predicting. We believe that play is an important vehicle for learning and development. There are many hands-on experiences including experiments in which they use their five senses. Science materials and equipment are available in the classrooms and the science lab. 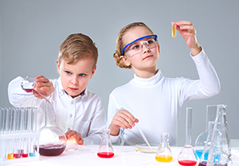 Science Fusion includes hands on experiments and on line experiments. Experiments, inquiry and the design process are part of each unit.